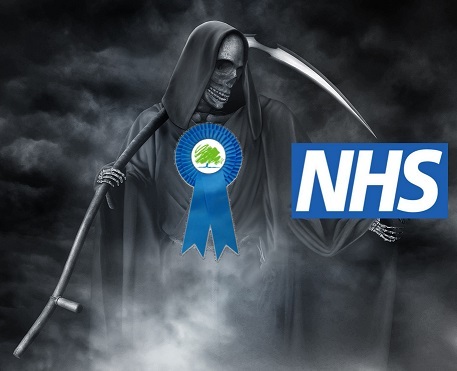 The privatisation of the National Health Service will be a very backward step with dire consequences. welcome to Edwardian Britain, a hundred years on. It’s been announced this afternoon that Monitor, the regulatory body for NHS Trusts, has begun the process of putting Mid Staffs NHS Foundation Trust (MSFT) into administration. Once this process is approved, which may only take a couple of weeks, the administrators of the Trust will have 150 days to come up with proposals from a range of options including the complete closure of the Trust. One option that is not included, however, is the continuation of MSFT in its current form. Reports on the decision focus on the Trust’s financial struggles and Monitor‘s statement that MSNHS needs to cut costs by 7% in order to be financially viable. The UK has continually dragged its feet on implementing EU environmental and employment legislation. It is normally implemented in a ‘watered down’ form, employing the cheapest techniques instead of ‘Best Available Technology’. Also, it is reliant on self-regulation (like the banks and look where that got us) and an arms length regulators who only act after a major incident. As long as a process can not be directly identified as being a problem, it is allowed to continue, as opposed to taking a precautionary approach. The UK is still the Dirty Man of Europe. This is a guest post by Caroline Jackson, former MEP and chairman of the European Parliament environment committee from 1999-2004. Thus said David Cameron in his recent “key speech” on Europe – and he sent an immediate shudder through the ranks of British environmentalists. What did he mean? Which bits of EU environmental policy is Britain going to raise in Brussels (when Owen Paterson has stopped worrying about horse/beef burgers)? What are the chances of getting anything changed anyway in existing legislation which it has been a pain to negotiate? Given that reform is needed in the EU approach to legislation (as I believe it is) is he going for the right targets? With the Conservative continuing with Labour’s dismantling of the National Health Service, the UK could see TB returning and it reaching epidemic proportions. We are an intensely populated island, which would make an ideal breeding ground for this disease spread rapidly and over-power the resources of the NHS. EUobserver.com / Social Affairs / Tuberculosis – an old plague comes back stronger. The i-Tree app has been used by many cities to calculate the monetary value of urban trees. KTGAC has also been told, by an ecologist, that under the CAVATs valuation scheme, each of the ‘unsuitable’ trees Trafford plan to fell on Greenfield/ Trevor/ Delamer are worth around £50-60,000. Let’s hope the council start to listen to the people who want to keep the trees before they score this huge own-goal. Thanks to Jayne Dillon for this link. Help raise funds to help restore a part of Manchester’s heritage. We have been informed the Crossley’s Boy Club, on Ashton Old Road, Lower Openshawe is to be demolished by the council shortly. Save Ancoats Dispensary Campaign group are holding a Fundraising Quiz Night from 6pm this Sunday at The Shamrock pub, Bengal St, Ancoats M4 6AQ. Monacle Dave will be our Quizmaster on the night, entry will be £2 per person with a maximum of four persons per team. There will be a super raffle, attractive gifts available to purchase and plenty of time to enjoy a nice tipple and friendly natter. All are very welcome to come along – don’t worry if you’re not already part of a team this will easily be arranged on the night . Manchester City Council make decisions without any consultation with local communities. When they announce their plans, they then state they will have a consultation about their plans, which were decided months earlier. They are not going to change what they have already planned to do and have already engaged contractors to carry out the work. The council is so dishonest with its dealing with local communities, I cannot understand any company with a reputation deals with them. Is it a case of ‘profits before people’? 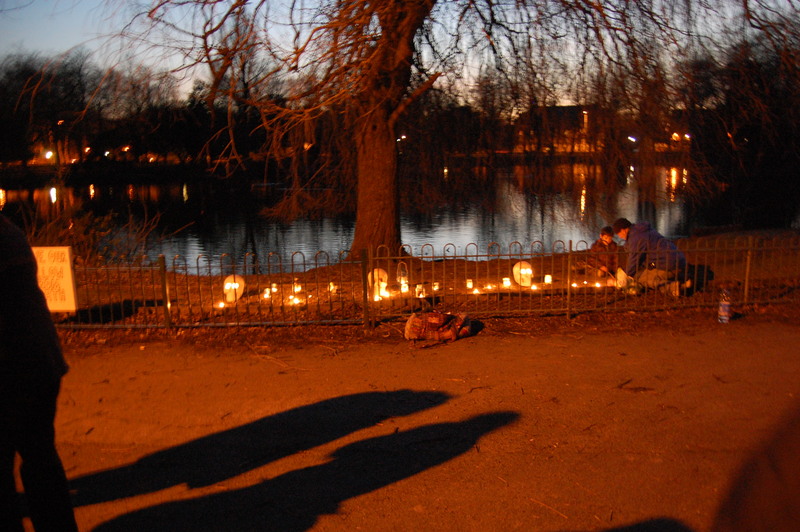 Council’s ‘Recent’ U-Turn on Park Plans Were Already in Place as Far Back as August 2011. 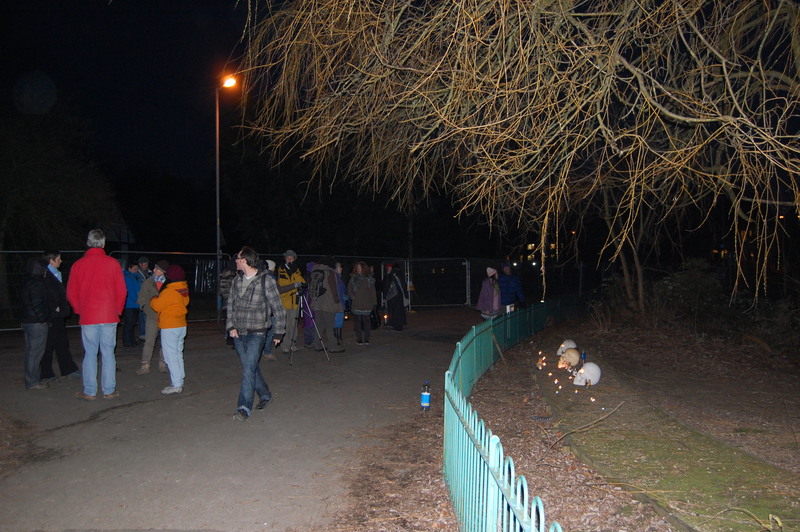 On Sunday 17th February 2013, a number of people came to the lakeside between 17:30 and 19:00 hrs to attend a vigil for the Ecocide taking place at Alexandra Park. 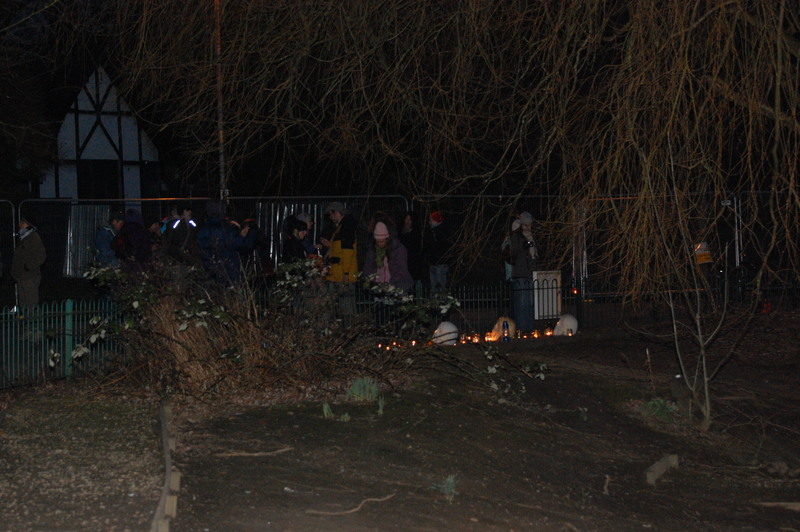 There were some members of Save Ancoats Dispensary vigil in attendance as well, having walked from Ancoats. Most people there understood the irreparable damage being done to the local environment and biodiversity. One young female had spotted a bat that very night. Manchester City Council had never carried out an Environmental Impact Assessment and had only carried out a cursory ecological assessment. If they had done so, they would of realised that their plans contravened their own policies and national policies towards the environment and biodiversity. And it is mind-boggling that the Heritage Lottery Fund, decided to fund this project, even though it is destroying what the Victorians had set out to do. They have proved themselves to be another ‘not-fit-for-purpose’ quango. And councillor Nigel Murphy had told me that the tree removal was necessary because the Park was unsafe at night. Not long ago, I emailed with residents living on the boundary of Barrack Street Park, were concerned about the lack of lighting at night. They felt unsafe crossing the park at night to visit neighbours. Nigel Murphy, replied saying there was no money for lighting on the park. And yet millions are being wasted on this ecocide on Alexandra Park.